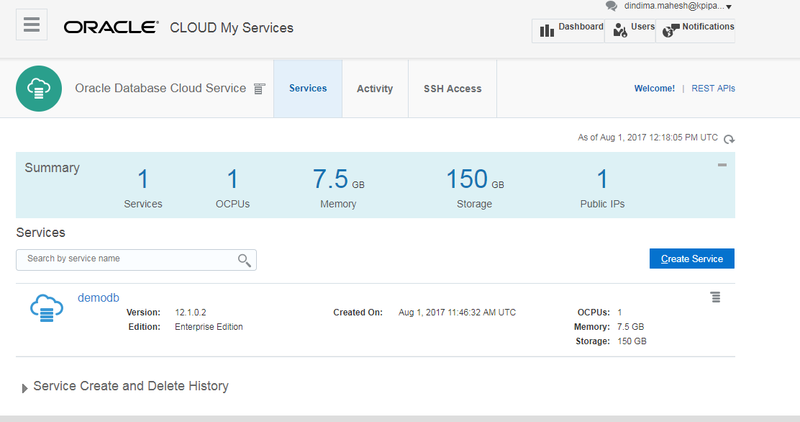 Create an Oracle Cloud account at https://cloud.oracle.com/tryit to access the 30-day free trial for OACS. 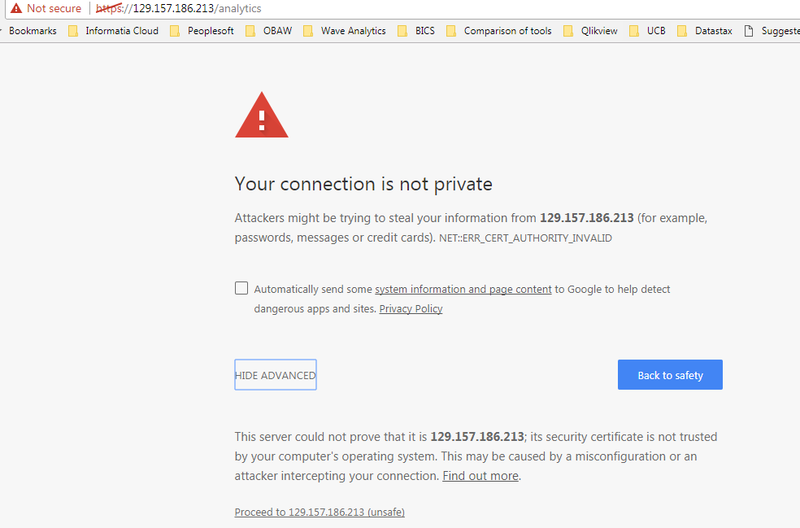 Check your inbox for an email with a temporary password to access OACS. 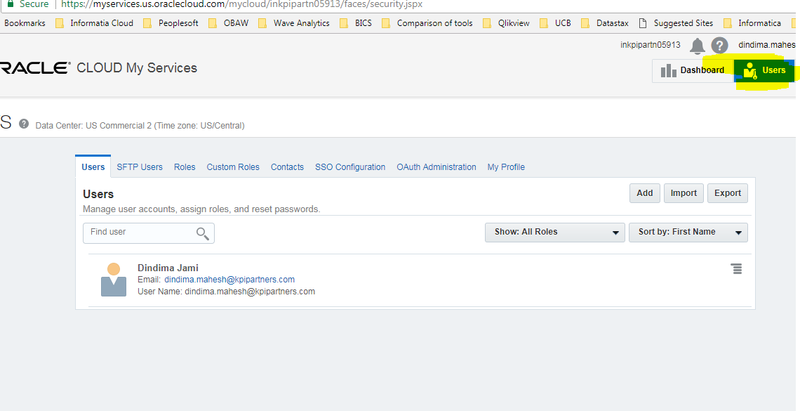 This password can be changed after you login by clicking the link in the mail. 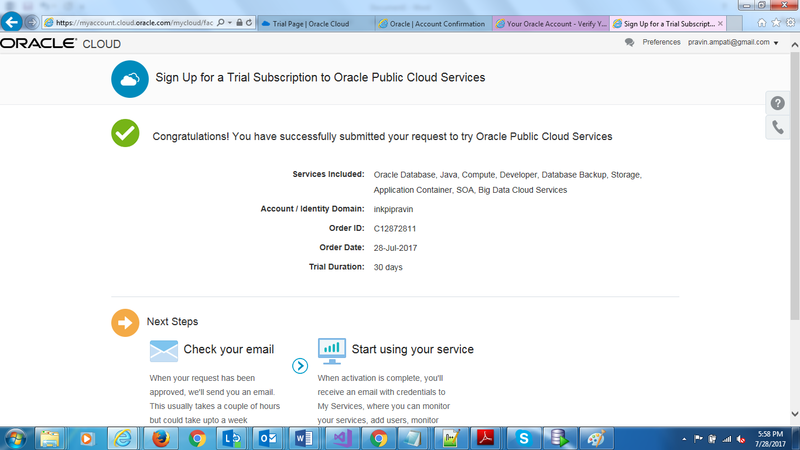 The email will have the details of all the subscriptions a cloud account is given access to. 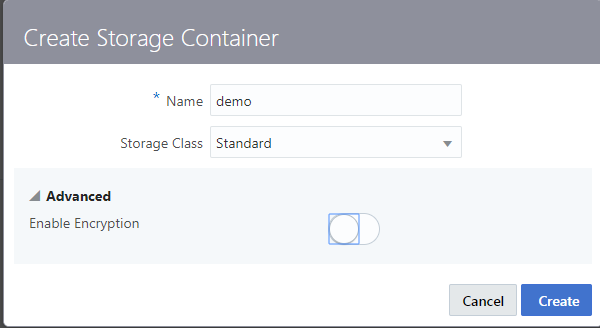 Click ‘Create Container’ to fetch the details required for service creation. 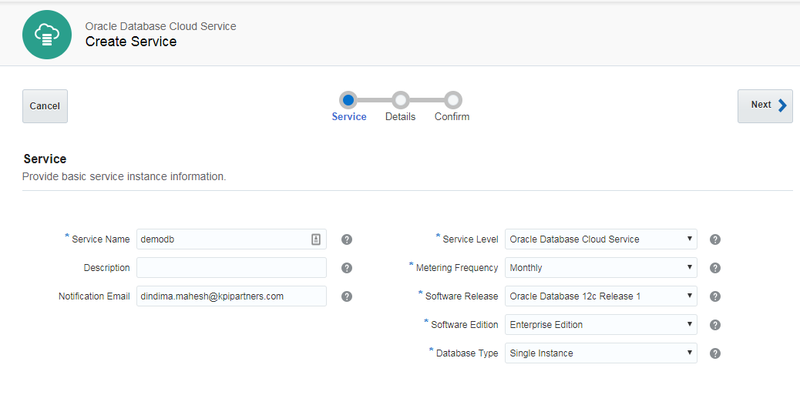 When a database service instance is created, a number of Oracle Compute Cloud Service access rules are created, but set to a disabled status. 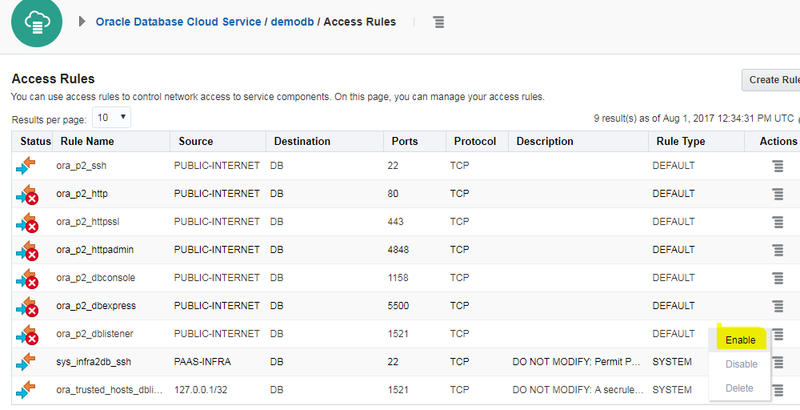 When you enable one of these predefined access rules, the given port on the compute node is opened to the public internet. 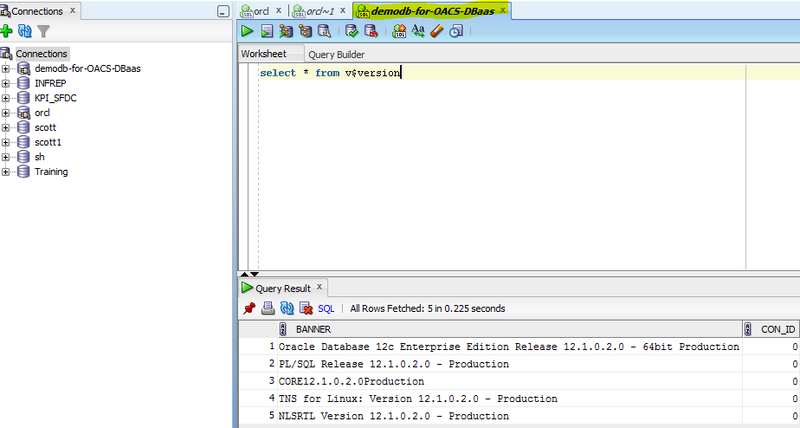 ora_p2_dblistener, which controls access to port 1521, the port used by SQL*Net, and therefore SQLDeveloper. 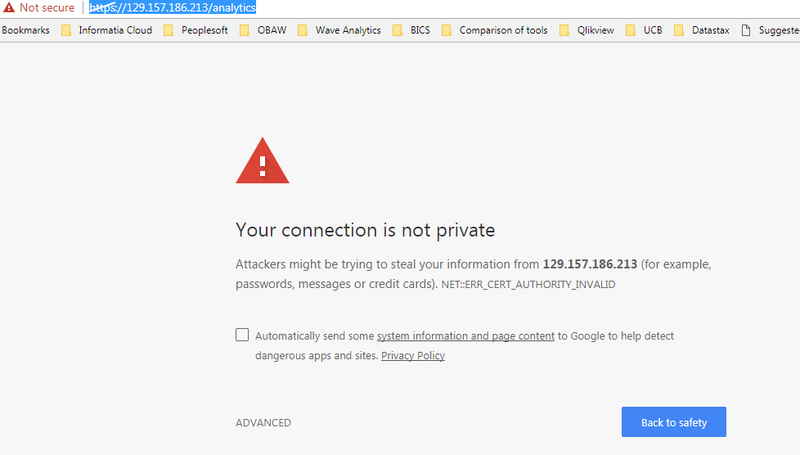 ora_p2_httpssl, which controls access to port 443, the port used for HTTPS connections to the instance including DBaaS Monitor. 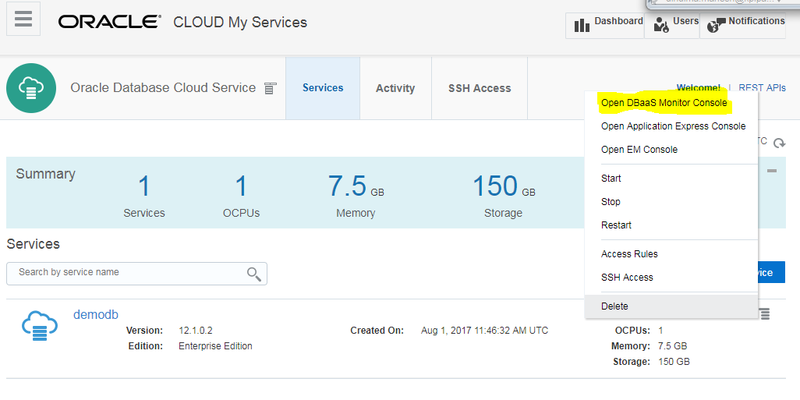 To enable these two automatically created Oracle Compute Cloud access rules from the Database Cloud Service console, click the hamburger menu beside the service name. 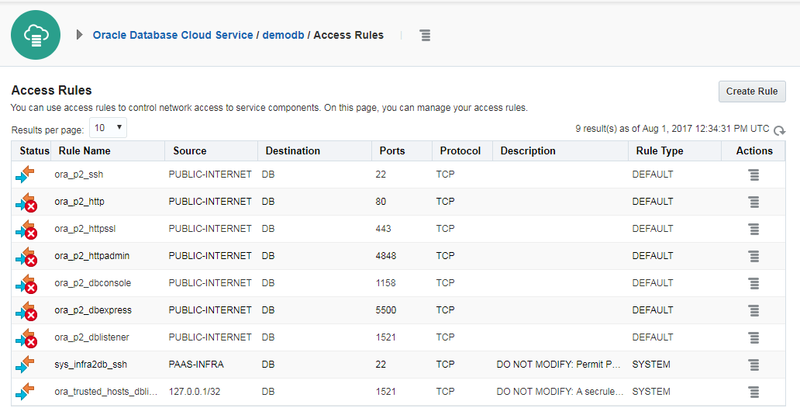 A list of access rules and their enabled status is displayed. 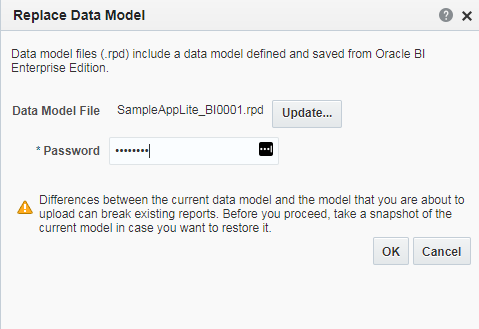 You can create, delete, and update access rules from this page. 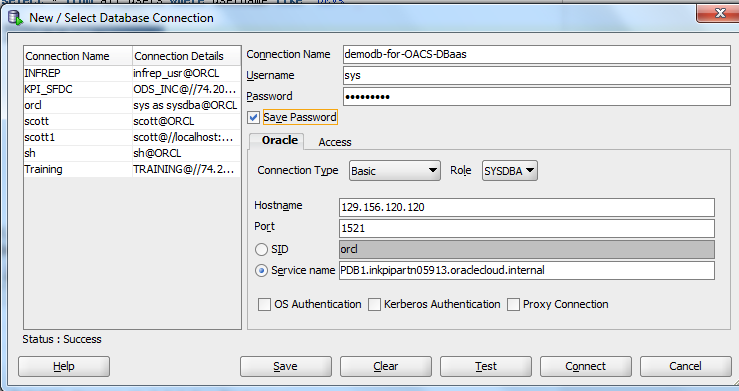 By default, only the ora_p2_ssh and ora_trusted_hosts_dblistener access rules are enabled. 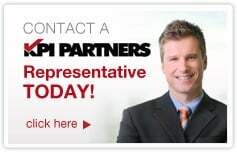 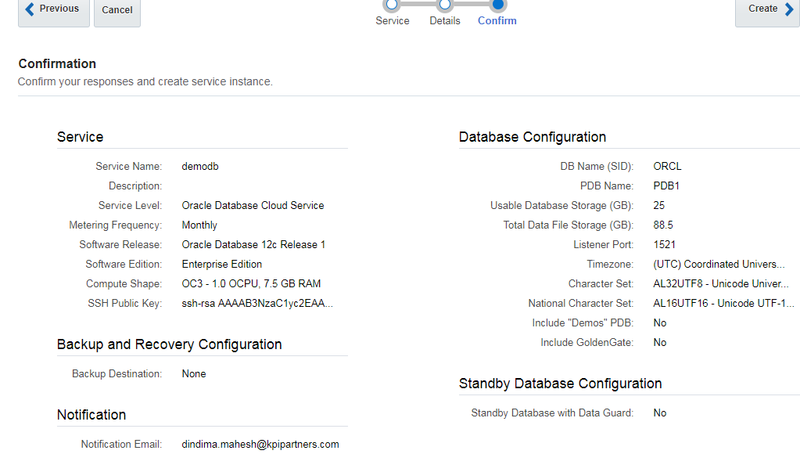 This database can be used just like any regular database. 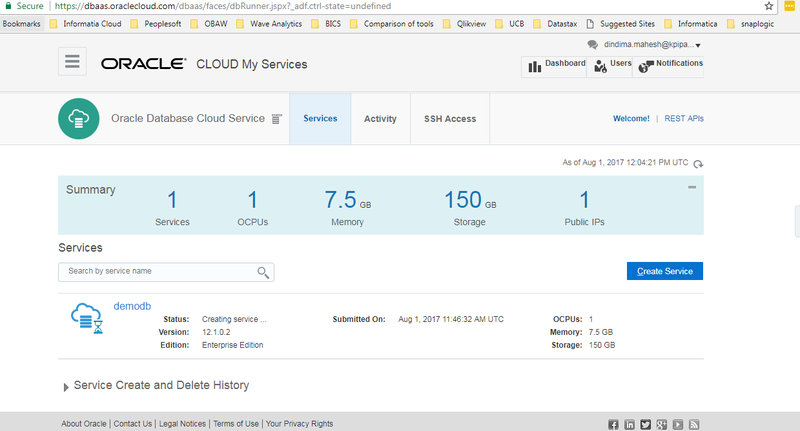 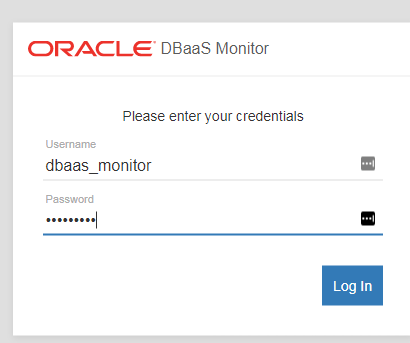 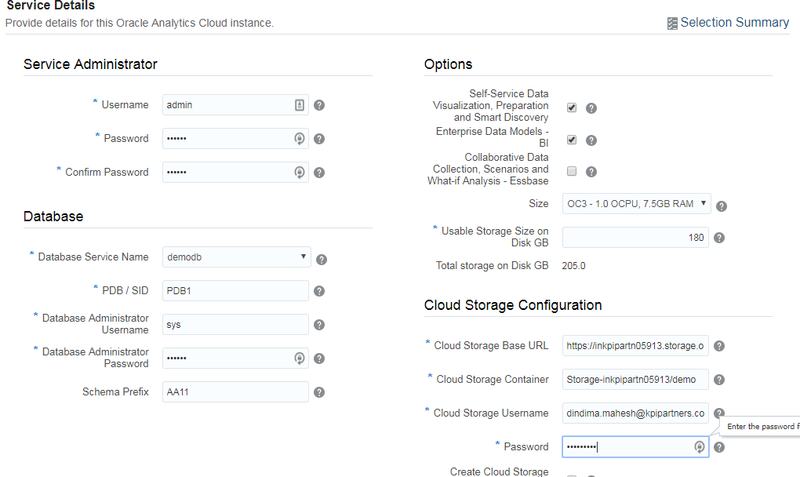 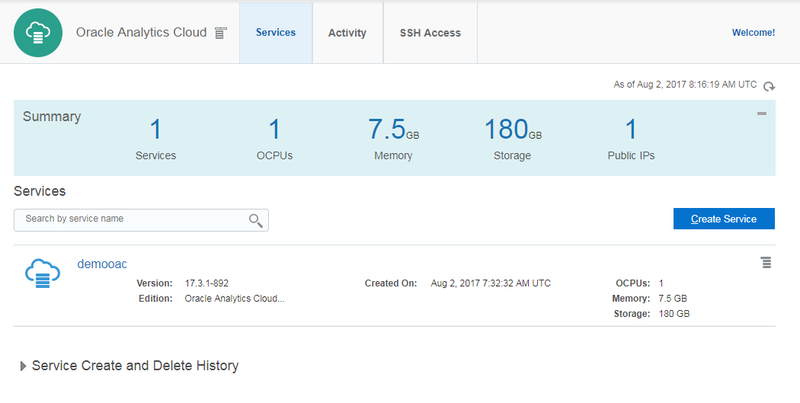 Use DBaaS Monitor to monitor Oracle Database Cloud Service and the database instances in it. 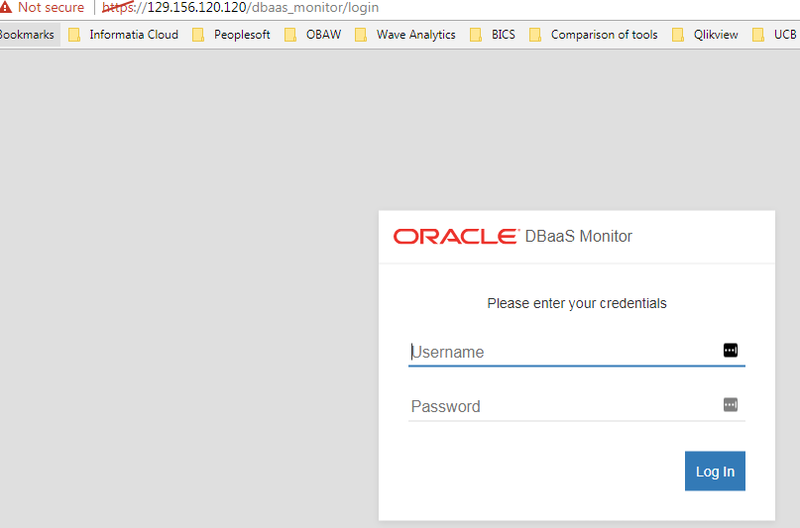 You connect to the Monitor via Port 443 of your DBaaS VM. 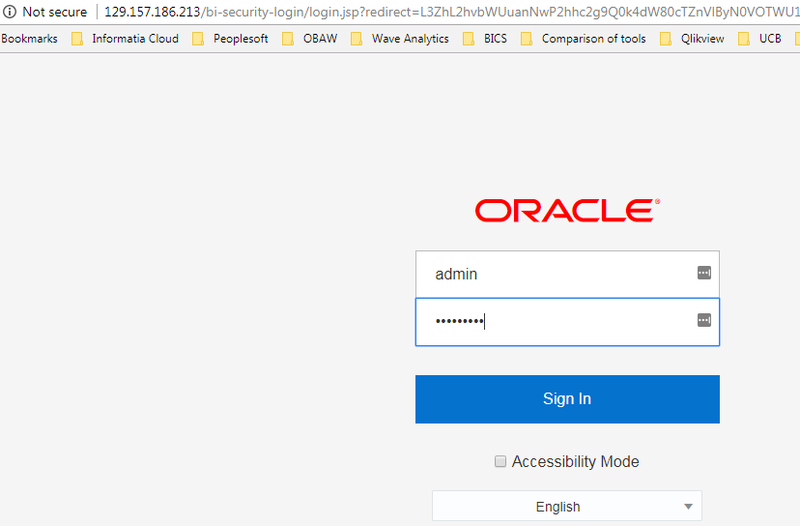 This port was opened earlier by enabling the access rule ora_p2_httpssl. 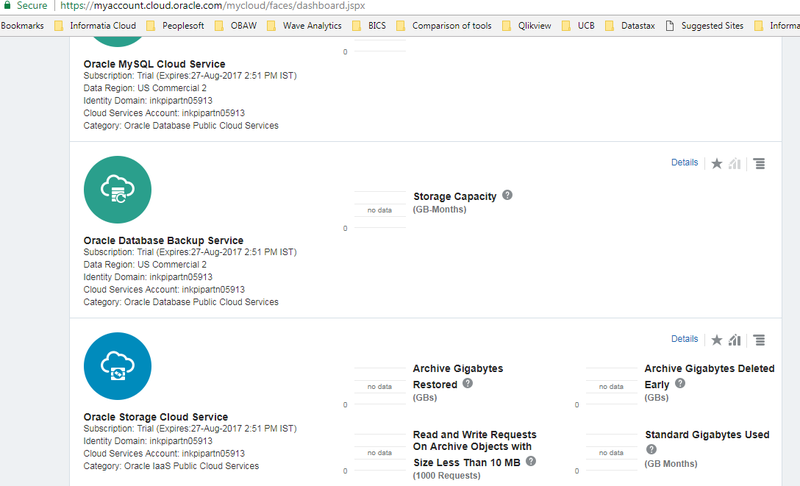 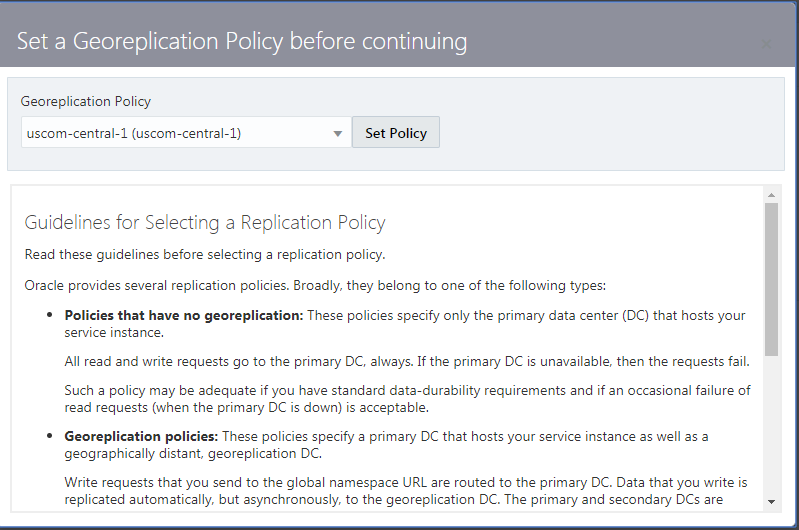 From the My Services console, return to the Database Cloud Service console. 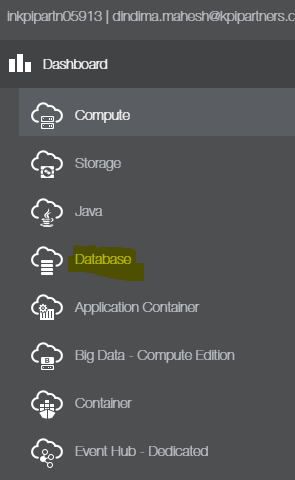 Click the menu next to the database instance you wish to monitor and note the variety of console choices. 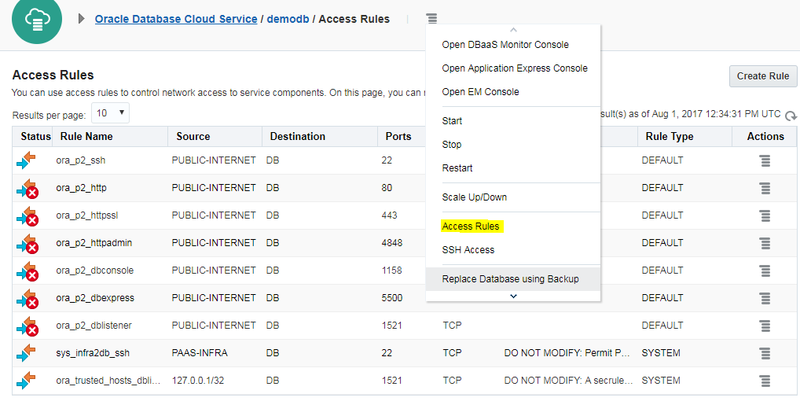 Click ‘Open DBaaS Monitor Console’. 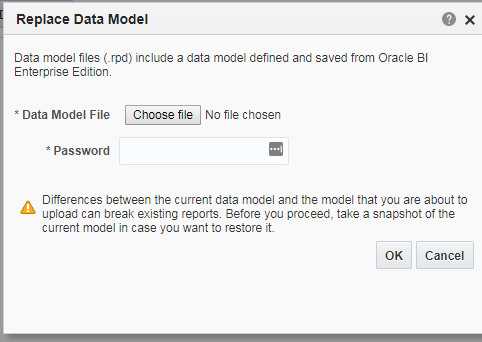 You should see a popup as shown below. 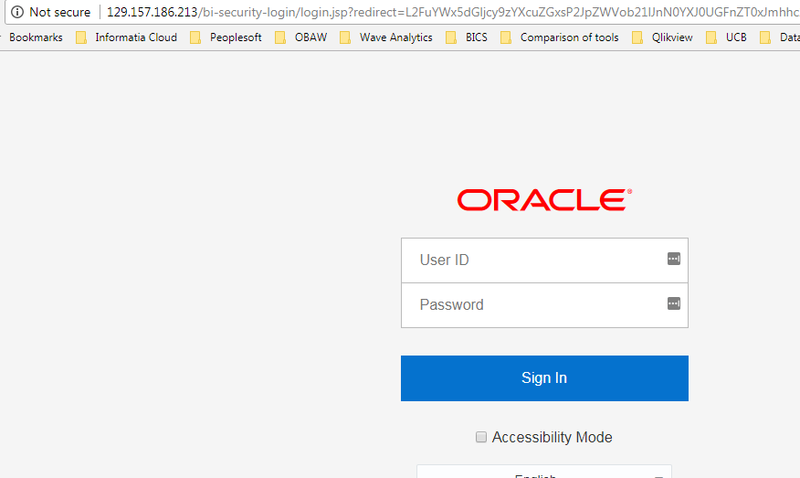 If it isn’t secure then click on ADVANCED option and open the page. 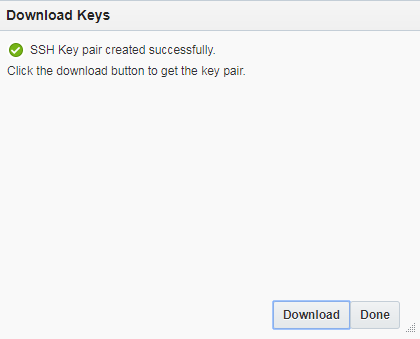 SSH public key can be the same as the database SSH public key. 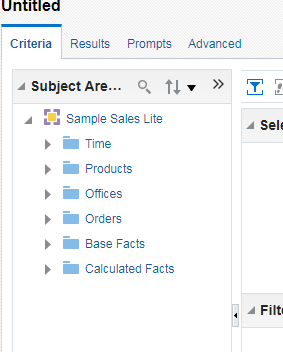 Click ‘Next’. 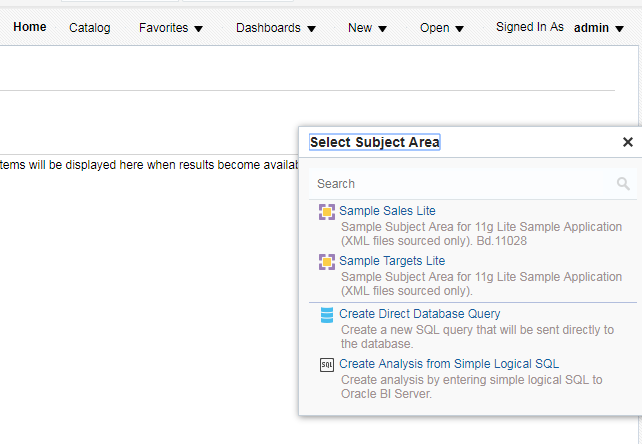 Admin password – Enter the password to access Analytics. 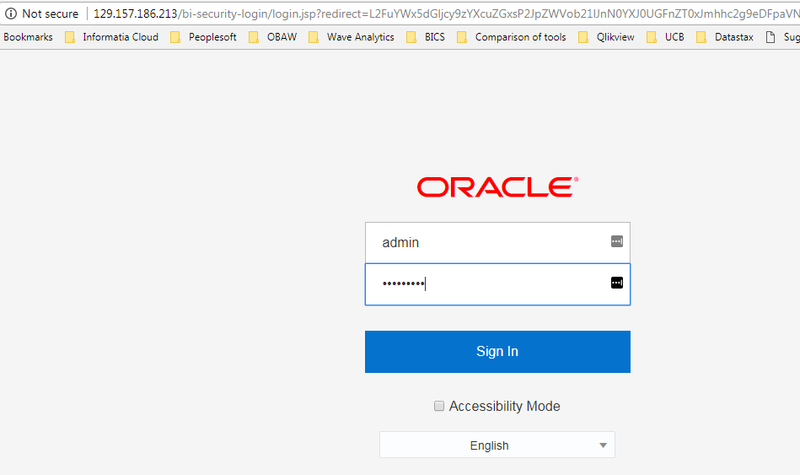 This password wasn’t set earlier. 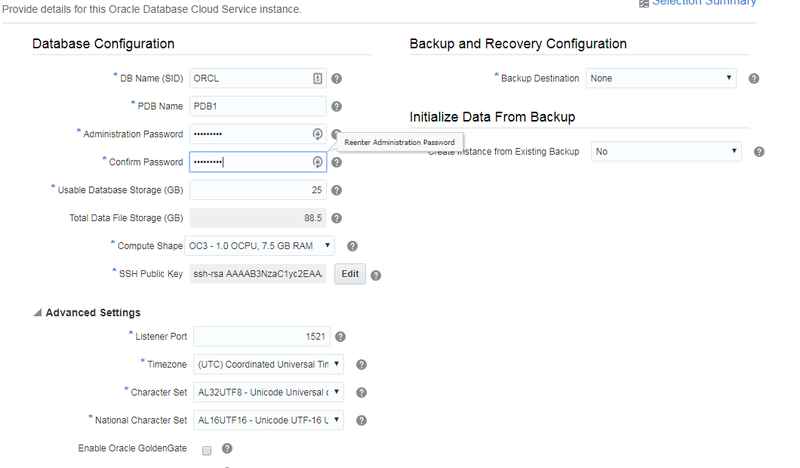 Enterprise Manager and Console are blocked by default. 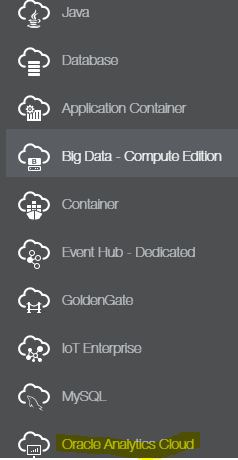 The port for these is 7001. 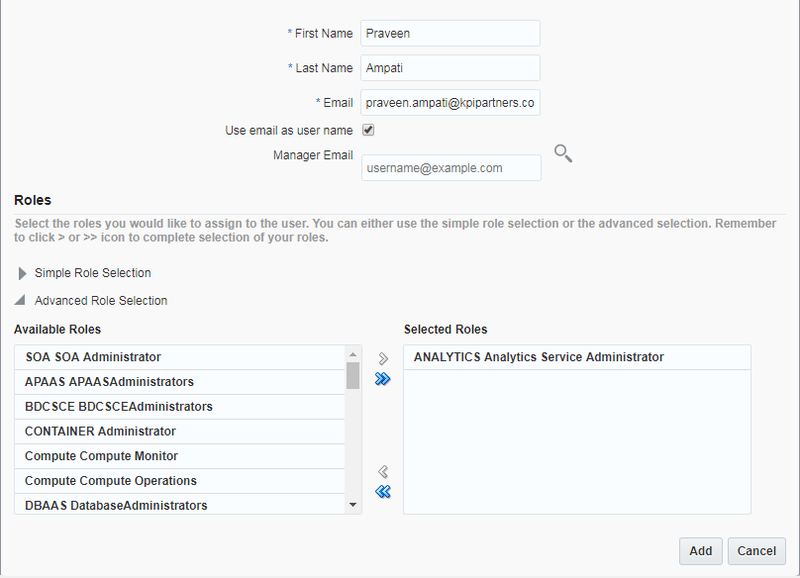 Specify the username, role and email address while creating a new user and click ‘Add’. 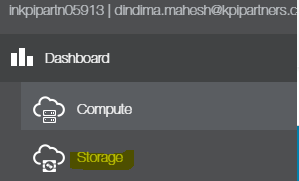 A mail will be sent to the added user. 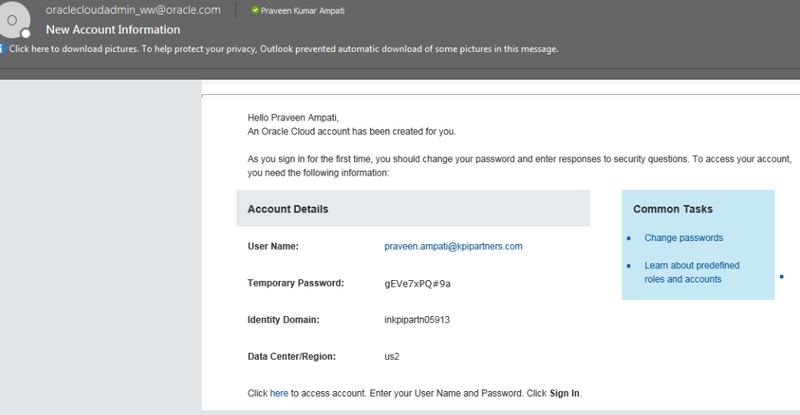 After clicking the ‘Click here to access account’, enter the username and temporary password as mentioned in email. 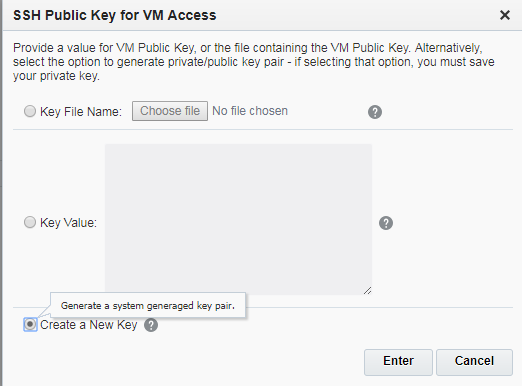 After clicking Submit, the user can change the password and security questions. 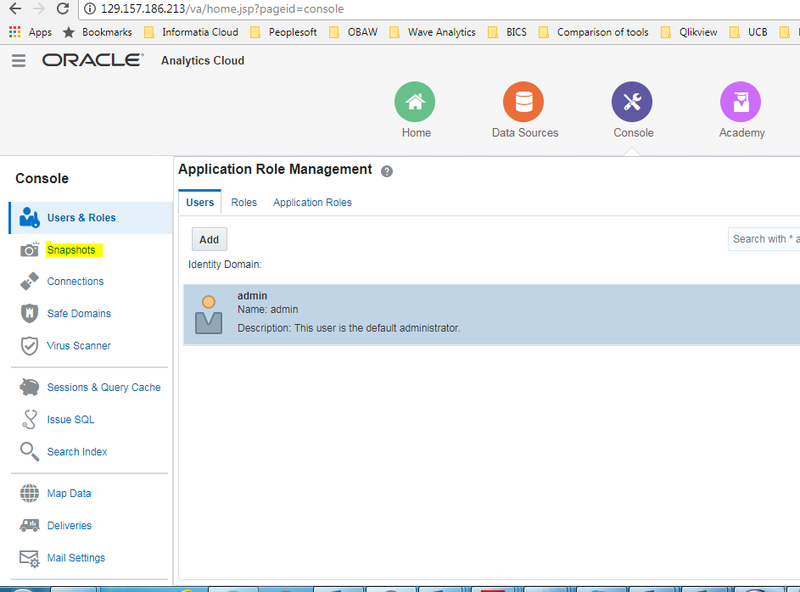 You can access only the service for which a role is assigned. 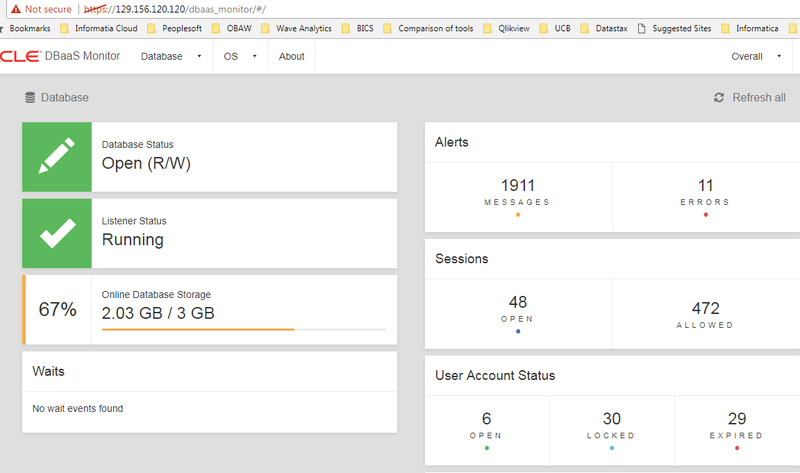 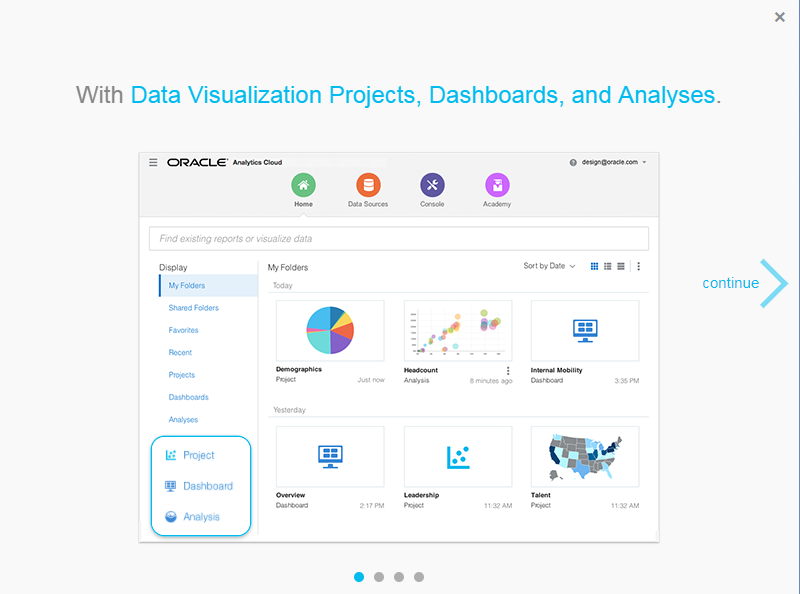 This can be seen in the cloud dashboard. 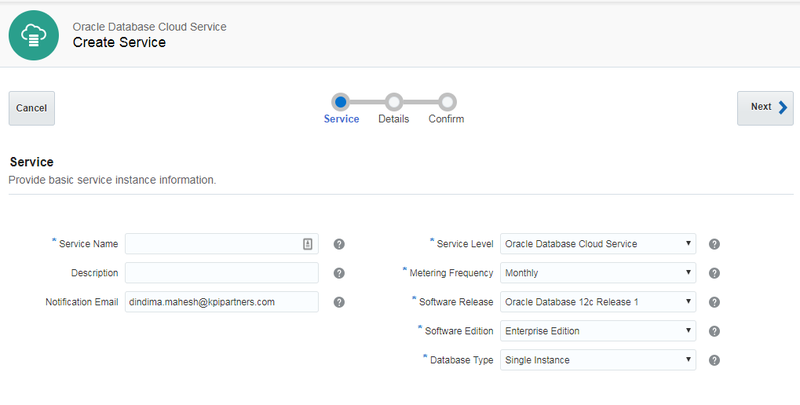 If the added user is an administrator he can create the service to which he’s assigned but cannot create other services. 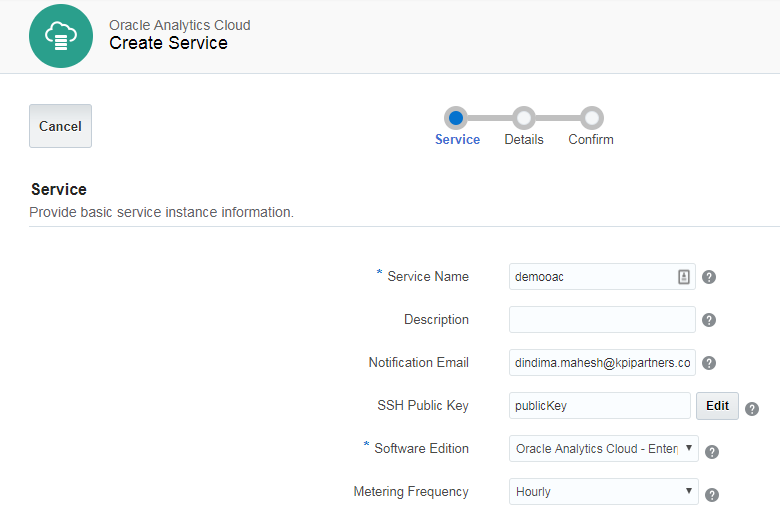 The added user is only an account in the cloud which means that in the above screenshot, Praveen is assigned the role of ‘Analytics Service Administrator’ but he will not be able to access OBIEE. 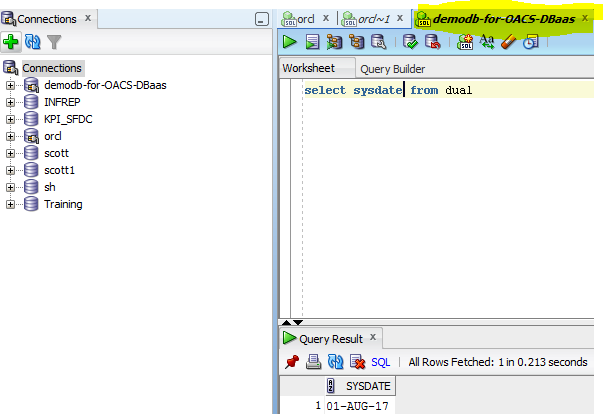 He will just see the OACS that has already been created and he can create a new OACS. 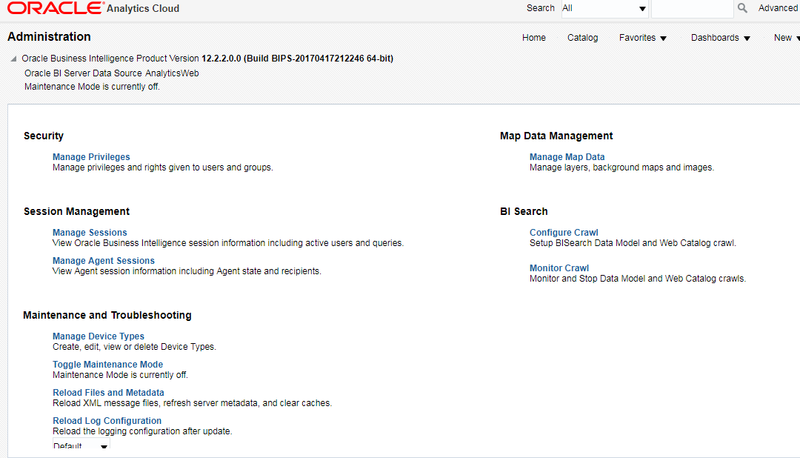 Once this is done, WebLogic Console and Enterprise Manager are accessible. 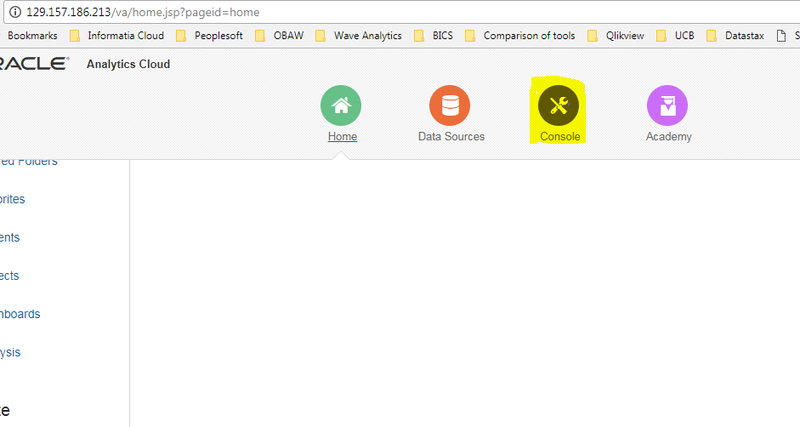 The URLs are in the following format. 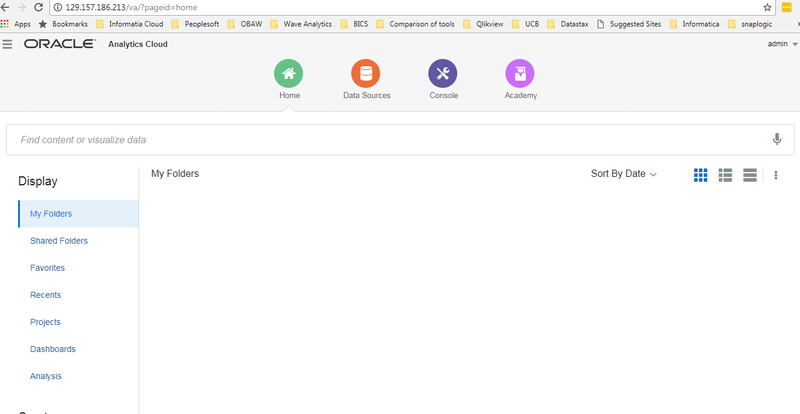 The setup process wasn’t easy but this blog post will definitely be helpful for anyone who would like to setup an OBIEE instance in the cloud. 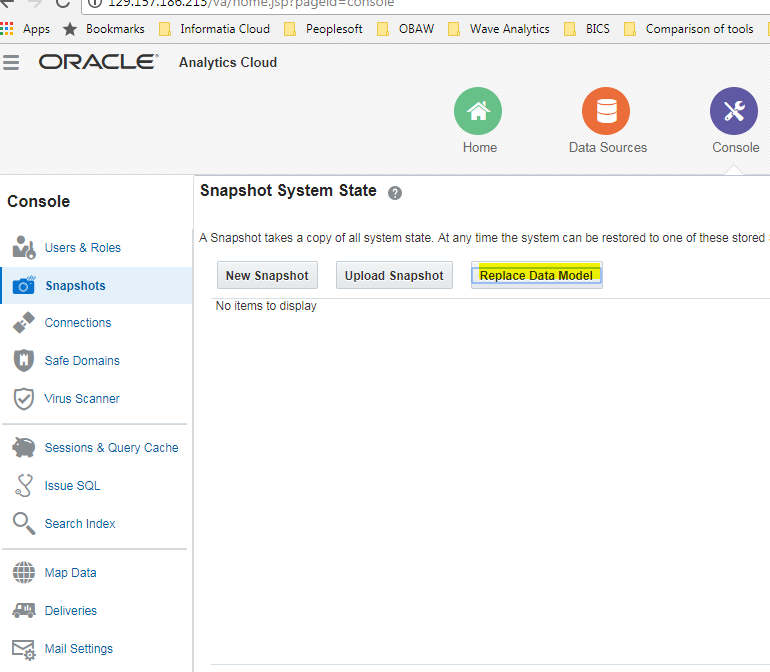 Note: Some of the screenshots or content shown in this blog post may not look the same as Oracle may update the UI in future releases. 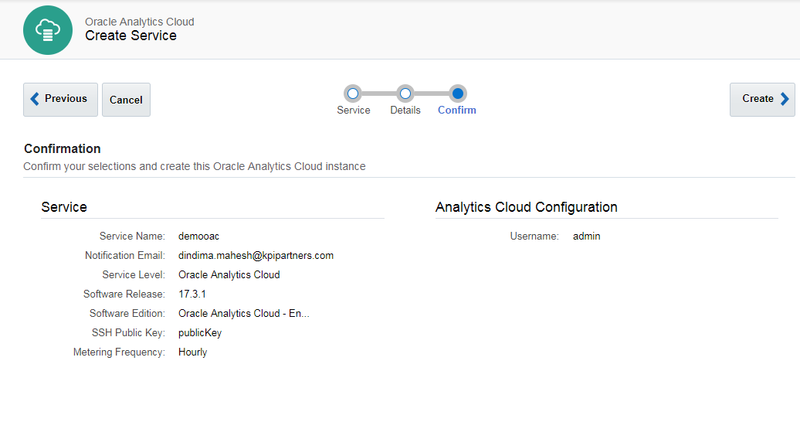 Dindima Mahesh Jami is a Senior Manager with expertise in Informatica, Informatica Cloud, Oracle BI Applications, OBIEE and 13 years of experience in Data Warehousing.